One of our favourite spots to take the barge and quads is the head of Goat Lake. Because of a large construction project last year at a friend's cabin, we didn't get there. This year a warm and sunny week in July was our best chance to get there while the lake level was high enough to get through Goat River's underwater rocks and tree stumps. 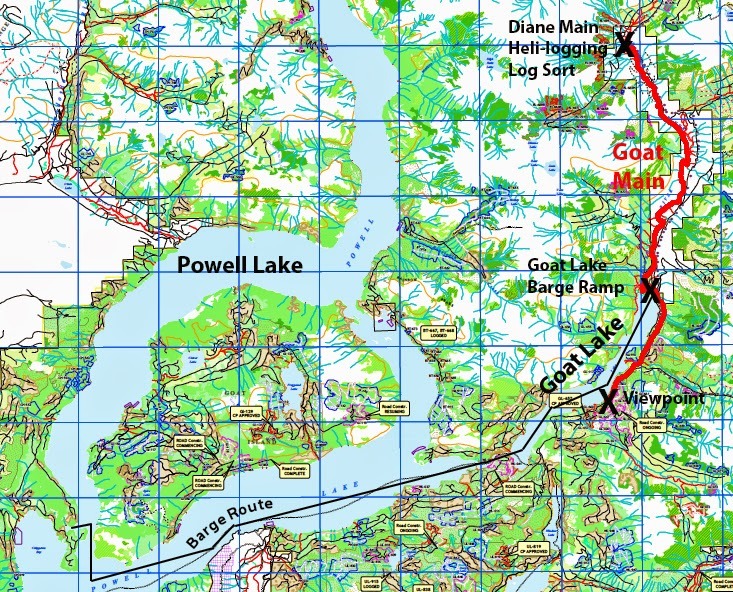 Barge and quad routes for Goat Lake. We offloaded our quads at the barge ramp and out of the way for two days of camping and riding on the logging roads and trails. Since there isn't a dock at this location, we used our empty barge for both our tent platform, lounging spot and kitchen area. The Eldred River flows into Goat Lake. Wayne took some time to do some catch and release fishing in the rushing water. We stopped at the Eldred Valley rock climbing location. After walking down to the river we met a climber and he pointed out friends high on the cliffs. Here's one of the steel cable lines they use to cross the river to reach the high cliffs on the other side. This trip we tried a new road, B Branch that heads up to Emma Lake. 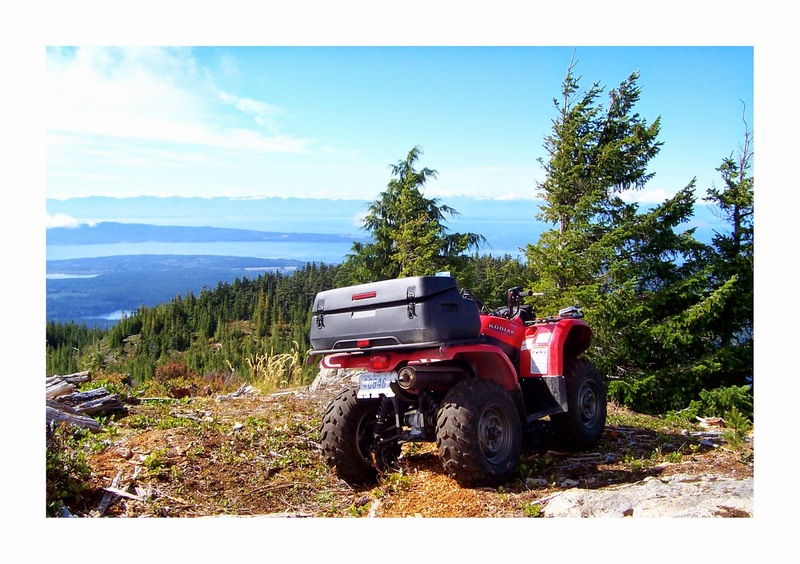 It was a nice shady overgrown logging road in good condition for a quad. We met a pickup coming out. He was having more difficulty, especially crossing a steep sided stream. To get to and from Goat Lake you pass through meandering Goat River. At low water it is shallow and difficult to navigate. Where Goat River empties into Powell Lake there's a stump forest where logging occurred prior to the installation of the dam in the early 1900s. Follow the markings and floating buoys to stay clear. 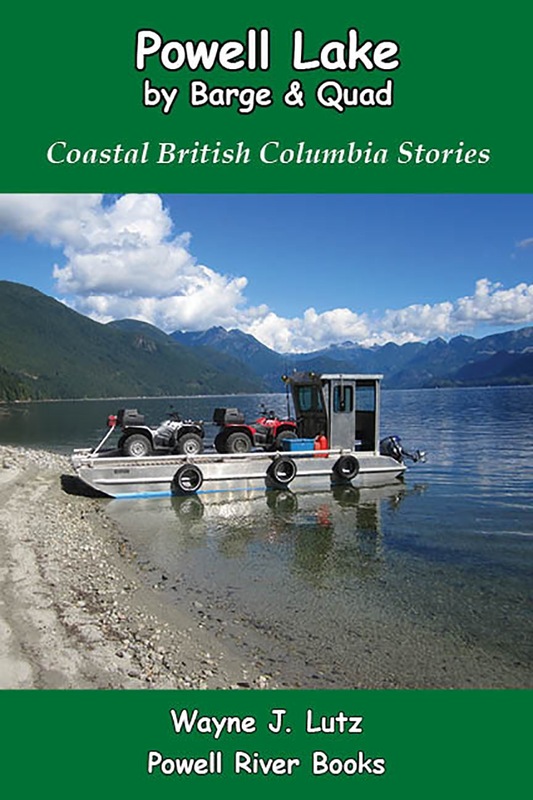 This passage is also part of the Powell River Canoe Route. Wayne and I share driving duties in the barge. For such a large craft it is easy to drive and maneuver. It's also very stable even in rough water. It's the best purchase we ever discovered on Craigslist.